When worries and anxious thoughts creep into your mind, they are hard to sweep away again. One small concern leads to a larger one and then another and another… and soon, you are surrounded by stressful thoughts. Once your worries take over, it’s difficult to get back on track. At best, you become distracted and irritable; at worst, you are plagued with self-doubt and other negative emotions. When you face moments like these, turn to journaling to recenter yourself, assuage your fears and calm your mind. The next time you feel your anxious, stressed or scattered, set aside a few minutes of journaling time. Kickstart your pen with one of these quick journal prompts, and return to your day more focused and relaxed. Do a worry purge in the pages of your journal. Without stopping, write down everything that is churning around in your mind. Once it is out of your head, give yourself permission to leave it in your journal and come back to it later with a clearer head. Write a list of the day’s accomplishments and victories, no matter how small. Celebrate each one individually. Sit quietly for a few minutes, just breathing and listening to your body, before you start journaling. What is it telling you? Where do you feel strong, healthy, energetic, relaxed? Where do you feel tense, worried, uncomfortable, tired? What is asking for more attention? Have a heart-to-heart talk with your inner critic. If she has been extra vocal today, take this opportunity to dismiss her opinions and tell her to hit the road. If he has been telling you all the things you are doing wrong, reply with all the things you are doing right. Pick a single positive word that you want to focus on today – such as joy, gratitude, love or courage. Journal about all the ways you have experienced this word lately and all the ways you want to. Choose one problem that has been causing you anxiety lately, and ask yourself questions about it, the way a close friend would. Ask supportive and encouraging questions, and answer them with complete honesty. Try looking at the situation from new angles, and be open to possible solutions that come up. Journal about a habit or activity you do that improves your mood or stress level without fail. Describe how you transform when you are engaged in this practice. How do you feel? How can you do this more often? Tell a story in which you made a positive difference in someone’s life. How did you change them for the better? How did it change you? What does this reflect about you as a person? Think about how you would spend a day doing only the things that make you feel excited, happy, engaged or fulfilled. Free-write a list of everything you would include in this day, from the time you wake up until you head to bed at night. Reread your list and choose at least one item to incorporate into your schedule today. 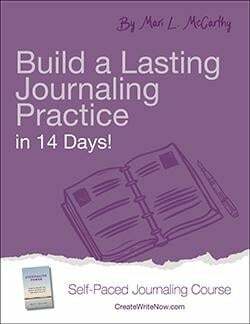 Looking for more journal prompts? Check out CreateWriteNow’s prompts page, updated weekly! If you want to learn how journaling can help you tackle life's challenges and calm your mind, please download the free eBook, The Journaling Guide to Manage The Stress and Strains of Life.